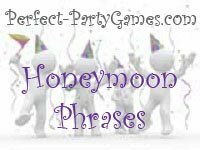 Summary: Honeymoon Phrases are things the bride said while opening gifts that make hilarious pillow talk. Have someone secretly write down everything the bride says while she is opening her gifts. Included the verbal reactions and exclamations as best you can. When she is finished, tell the guests that you have a list of things that the bride will be saying on her wedding night. Then read the list back. This is hilarious! You get statements such as "How do I put this on?" and "Oh my Gosh!"